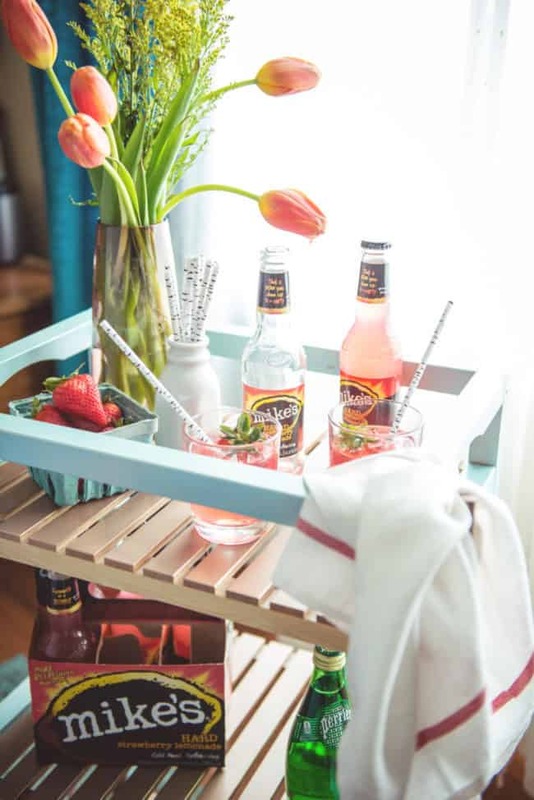 A refreshing strawberry spritzer cocktail recipe and a fun DIY Ikea Hack Bar Cart are all you need to create a fun little happy hour on the fly! This post in in partnership with Mike’s Hard Lemonade, however, my mad DIY skills are all my own. Confession: I am not a DIY-er. 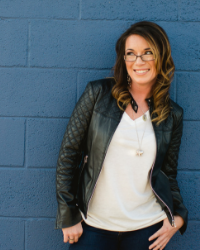 I am pretty sure whatever gene makes a person crafty skipped me by a mile, but every now and then, I really want to try making something fun and spunky for my home that has my personality all over it! 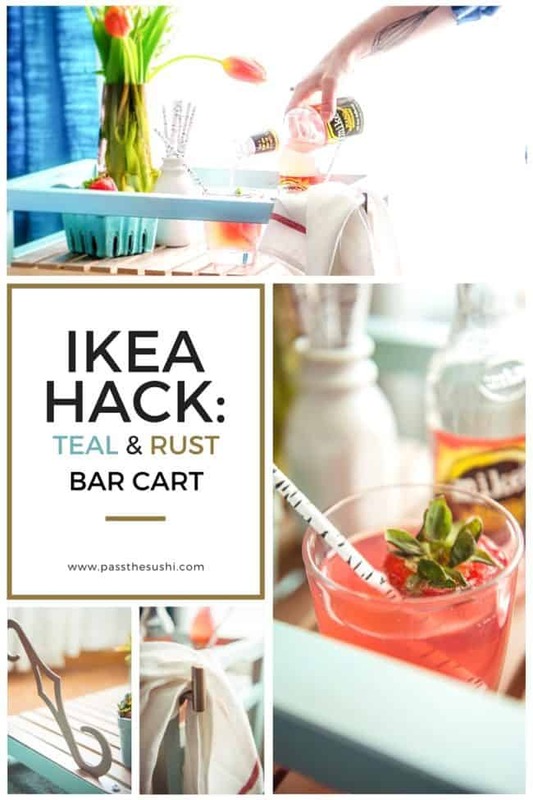 Luckily for me, I had a pretty good idea of what I wanted when this little DIY bar cart idea struck me, and a good friend nearby to help cheer me on with a drink in hand. A quick run to the hardware store for that custom paint job, and I started calling friends inviting them over for a Friday night cocktail hour at my house. Now, onto my Ikea hack bar cart! For being pretty horrible at crafting, I have to admit, I am pretty pleased with how this turned out. Who knows, maybe I will start showcasing some more of these random little projects around my home. Planning a fun social get together and looking to spruce up your space with a funky little bar cart, perfect for holding all of your cocktail items? I was able to whip up this bar cart all before my friends arrived for an impromptu happy hour celebration! With just two cans of spray paint and a few accents from the local hardware store, my little DIY cart looks great and got a ton of compliments. I can’t wait to show it off next weekend for my Sunday Brunch get together and burger bar that I am throwing out back! All you need is an inexpensive wooden cart (I got mine from Ikea, but any will do will do) for only $40. With the spray paint and accents, the whole thing was under $60 and looks great in my house. Make sure it has wheels, or you can add some so that this little cart can roll into any room or outside on the patio for every get together all season long! Arrange an area with all of your parts out so that you can spray paint them. Spray paint the accents with the metallic spray paint and allow to dry. Flip and cover and spray paint the other site. While the accents dry, spray paint the rest of the cart with the pearl finished teal. Allow to dry. Following the directions included with the cart, assemble the cart. Measure, mark, and drill starter holes for the screws for the cart handle. Screw in place. Repeat for the knobs. Add the metal accents at the bottom and screw securely in place. Now decorate and fill the cart up. 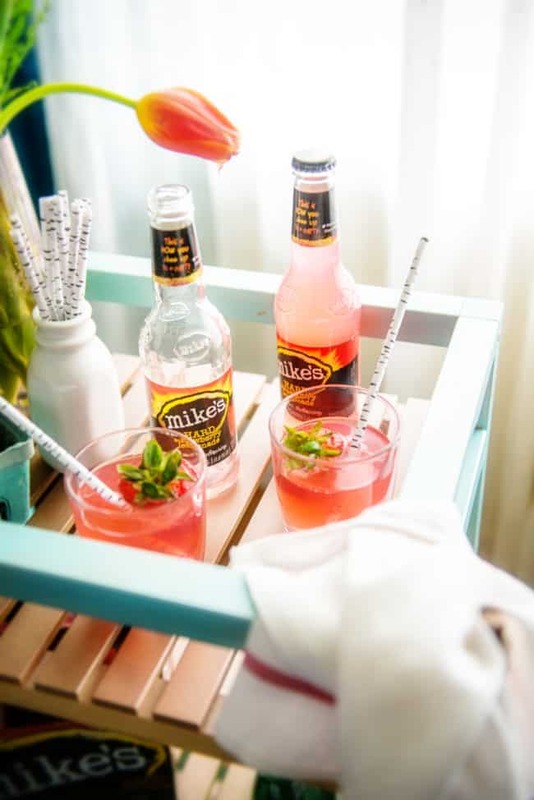 Stock the cart with sparkling water, mike’s hard Strawberry Lemonade (perfectly refreshing for the season! ), clean glasses, fun straws, and fresh berries. Hang fresh clean linens from the hooks and set out as a self-serve cocktail area so you and your friends can hang out and enjoy! Pour the mike’s into a tall glass with ice, filling to about half way. Add the Aperol, and finish off with the sparkling water. Stir with a long spoon or straw. Oh and quick and easy guide to throwing a stress-free dinner party on the fly! Cheers! Let’s get to entertaining all summer long!